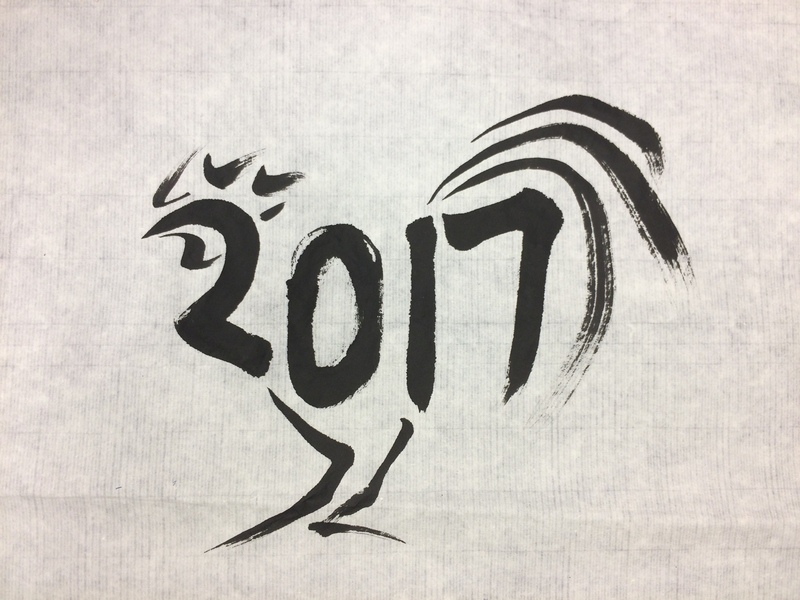 For this Chinese New Years, I wanted to take a shot at making my own version of a graphic hat captured the year of the rooster. A quick look revealed a lot of designs that were very stylistic or that only hinted at the rooster partially. I decided that I wanted to attempt something that utilized the whole number as part of the rooster while retaining the legibility of the numbers. A quick initial investigation on the form revealed to me where I would like the numbers to be and I then began to bring the numbers back to a more legible state. Attempting to keep the numbers in a printed font like state proved difficult as the blockiness conflicted with he angles I wanted for the rooster (the upwards angle of the head and neck and of the tail). I ended up deciding to angle the numbers slightly up at each end to accommodate this. Then it was onwards to the calligraphy. Ink is a very punishing medium; without layers and undo buttons, a single mistake on a later stroke can make an entire image trash. On the other hand, this means that you get a lot of practice, and by the final draft, every stroke is very familiar to you. As I started, I still needed to play with thickness and dryness of the brush. With a bit of workshopping with my friend Dan Lin (https://aeveis.tumblr.com/), here is my final version below. Something that I’ve been trying to figure out what to do with is my affinity for random geometric problems (e.g. staring at a half-covered design on a random pizza box and realizing that the lines of the “pizza slices” do not intersect at the center of the arc in which they lie). Today, I was pondering over the toroidal map type in Civilization. The game still plays on a planar rectangular projection of the map, but how much distortion should there really be? I’m going to assume that the width of the map is the maximum latitudinal circumference around the outside, and therefore I am interested in how much narrower the “poles” should really be to meet each other on the inside of the torus. My initial condition therefore is that [map width] = 2 * pi * ([major radius] + [minor radius]) and that [map height] = 2 * pi * [minor radius]. I am interested in the minimum latitudinal circumference, described by 2 * pi * ([major radius] – [minor radius]). After some very basic algebra, the conclusion is that the poles should be only as wide as [map width] – 2 * [map height], a significant result! The distortion is quite severe for maps of appreciable height! If a toroidal Civ map was twice as wide as it was tall, the poles would all still come to a single point, which is not much actual space for units and cities placed up there. Though, if we had to play on Civ maps where distance was physically accurate given the 3D shape of the world, it’d probably be even more confusing to keep track of.